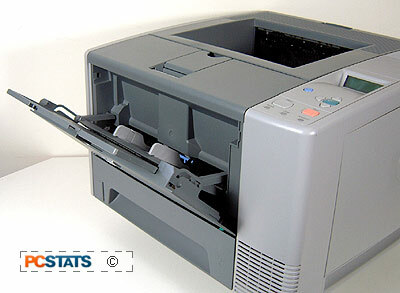 The first thing we noticed about the HP LaserJet 2420dn once we got down to actually printing was its impressive speed. HP claims a wait time of less than 10seconds between cueing up a print job and the printer starting to spit out pages, and we'd say this was a conservative estimate. This printer is extremely quick to respond. The full duplex printing worked well, and used the standard system of spitting the half-completed pages out, then rolling them back in to print the second side. The time from the beginning of a print job to the first page being printed averaged about 5.5 seconds in our experience. From power-off to ready state took ~20seconds. Our initial print tests showed crisp text and and graphic quality. Duplex printing worked well also, though the HP LaserJet 2420dn goes through a rather traumatic process to print each page, spitting it half out then audibly reversing its gears and pulling the page back in, before reversing the gears again and ejecting the finished page. The results were great, but we have to wonder how much wear and tear constant duplexing will inflict on the printer. Another thing we noticed was the flimsy plastic multipurpose paper tray. This thin plastic tray is supposed to hold 150 sheets of paper, but we're not reassured by its apparent lack of strength. We could easily see this snapping off, especially when extended. Our black and white image quality tests were accomplished with PDF versions of the following two images printed in both 600 and 1200 dpi. Text quality was excellent at both resolutions, with crisp text perfectly legible down to 6-pt type. The 4pt. type suffered from gaps in some of the letters, but was still completely readable. The gradient line and fill test image gave interesting results. Both the horizontal and vertical gradients were well reproduced with little visible banding at 600dpi and 1200dpi, but suffered from a mottled effect. This mottling was much more pronounced on the 1200dpi version of the test. The line test was reproduced well on both settings, with some very minor 'stepping' between every sixth line. No major problems here though, and the image precision overall is excellent. Our picture tests showed that the HP LaserJet 2420dn has excellent detail and shading abilities, but our test image continued to suffer from a noticeable mottling effect in darker areas. The mottling was much more pronounced on the 1200dpi images, and was reduced slightly when using brighter paper. On 2416 Bright paper at 1200dpi, the mottling was pronounced enough to effect image quality negatively, while the effect was hardly noticeable on brighter paper.